Wee Companions Small Animal Adoption, Inc. - It's a Zoo in Here! Leading a successful adoption event equates to commanding a slick military operation and fine tuning an orchestral performance while being lead clown in the center ring of a circus. It’s an all out show along with props, a cast of many stars, both human and animal, along with unexpected ad libs and forgotten lines. It’s a whirlwind of improv and, at times, heckling from the peanut gallery. We start by making sure all the requested animals are present, and correct, as our top priority, but there will always be visitors who wander up and down the rows of present animals and exclaim, “You haven’t brought Joe the guinea pig? We’ve waited a month and wanted to see him!” I usually apologize since it seems to be the right thing to do, but wonder why, since out of the 100’s of guineas in the rescue, how could I have known telepathically to bring Joe? No one else seems worth checking out, they are not Joe and Joe is added to the next adoption event list. The “Joe lovers” leave grumbling. Arrival at an event usually entails being spotted by the early bird adopters who have arrived just as I am pulling into the parking lot. There are squeals of delight ringing out as I struggle to unload the endless cages, tables, water bottles, kitchen sink, Tom Cobley, and all, into the provided adoption space (which is roughly the size of a walk in closet), while I hear exclamations of “Oh look at that one!”. It’s a race now to get set up, as the line of early birds seems to be lengthening. I glance around for the familiar volunteer shirt of my adoption team, but not one is in sight, because I have arrived early…along with the rest of San Diego, it would seem. “Please don’t put your fingers in the rat cages dear, I cannot guarantee they won’t bite”, I smile but question why humans have the natural instinct to stick the ends of their fingers in small animal cages. I am now feeling the pressure and with an audience to watch me work I don my poker face and move into Nurse Ratched efficiency. The early birds are a little more wary now of asking me, a third time, about the animals they want to adopt. By the time the event is technically supposed to start, I am ready for a tea break! Volunteers are finally arriving, on time for the event, but having missed the early bird specials. Some volunteers come in with their coffees in one hand and foster animals in the other. One of our Junior Volunteers arrives with an Earl Gray tea and scone for me, “Good morning Fenella, our Volunteer Coordinator Julie, told me to deliver this to you before I do anything else.” My breathing starts to slow down and my growling stomach starts behaving. Our early birds are now moving in to get first dibs on certain animals and volunteers are recruited and assigned families. Families are interviewed and animals are paraded, petted, and then either snapped up or replaced back into their travel cages. Adoptions start and paperwork is now flying about. We have 5 adoptions and more pending! Over the PA system, “Wee Companions, there is a phone call for Fenella! !” I disentangle myself from the sea of humanity and animal related stuff to pick up the phone with the familiarity of a staff member only to hear a common story, “We just rescued this guinea pig but it seems sick and I can’t afford to take it to the vet so can you guys take it?” Yes, I say quickly, glancing over at the crowd at the adoption tables. Our bonding pens are now overflowing from our provided “closet” adoption space and we are scolded by the staff for blocking the exits. As I walk back over, new orders are delivered to the troops to rearrange positioning and we carry on. Cages of unwanted pets are now arriving or being delivered to our events. This is usually prearranged, but not always. “Yes, we love them but….” In my imagination I chase them out of the store rattling my donation box which is sitting, sadly empty, behind the sobbing 2 year old and the allergy overwhelmed 8 year old. “Can you spare some change to help us to take care of your pets for a while? !” Animals in varied conditions are relinquished and the senior volunteers are already assessing and will decide who will go home with whom at the end of the day. 7 adoptions! Meanwhile, children are randomly dropped off to go and “visit with the animals” at our events while the adults go in to shop. Suddenly I must keep an open eye for little ones aged anywhere from toddler to teen wandering around asking to hold animals without an adult in sight. I guess we seem friendly ladies who like to babysit as well as take care of animals. There’s been more than one time of having to go and track down a family with a “lost child” in tow. The crowd is still jostling and a few come by to ask “What’s that?” “It is a guinea pig.” “How much?” “Well it varies.” “It’s cute I want one”. “Here take a care sheet and go and do some research!” “Do you know they eat guinea pigs in Peru?” Through gritted teeth, “yes”…. Smiles are beginning to wear thin, we are getting tired. For the 11th time that day we ask the burly dog owner not to let their pit bull sniff at the animals in the cages. “Oh, she won’t hurt them.” Try explaining that to the guinea pig who is shaking at the back of the cage saying its last rites. Dog barks in excitement and it’s enough to almost shatter the glass of our tiny space. 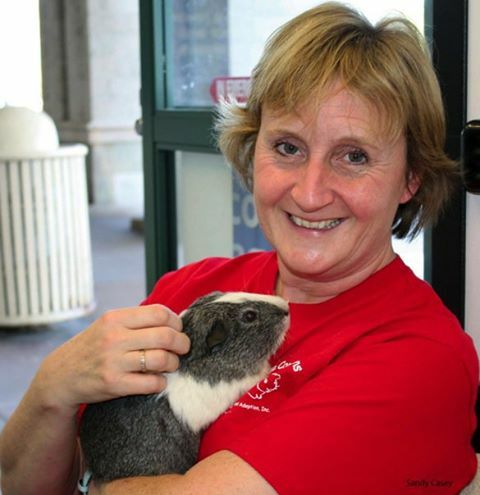 Our Volunteer Coordinator steps in between the dog, that is larger than her, and the guinea cages, smiling, “Thank you, now please move along friend.” Final adoption count 9! The team prides itself on a successful adoption day. Most volunteers have managed to squeeze in a lunch break, some of us haven’t. Our heads are buzzing, our legs are aching, but we have found homes for 9 animals. A brave junior volunteer dares to ask how many animals we took in…well, looks like we took in 12. I am no math expert but the equation seems out of sorts. Wow you are a true talent. I was right in there with you smelling the smells, hearing the sounds, and feeling that all too familiar frustration that comse from dealing with the moggles. Fantastic job - cant wait to read the next instalment. Going to share on LAGPR page!! Nice, Fenella...hehehe! What if guinea pigs could talk or write like humans? The things they would say in this blog - and hey, there's a film making idea. Thanks for posting this - very interesting. Fenella, When in the world did you have time to write this wonderful article? Thank you for sharing! And thanks for all you do for our students!